The Wizard, Dorothy, and Adventure Dorothy Gale is glady joining her Uncle Henry in California to visit relatives who live at Hugson's Ranch, after their vacation from Australia in Ozma of Oz. Dorothy meets Hugson's nephew who is her second cousin, Zeb of Hugson's Ranch. Dorothy, Eureka (her cat) and Zeb are riding a buggy being pulled by a cab-horse named Jim when a violent earthquake hits and starts to open a crevice beneath them that sends them all hurtling deep into the chasm, being swallowed by the bowels of the Earth. Dorothy, Eureka, Jim, Zeb, and the buggy alight into the Land of the Mangaboos, a race of cold, heartless people made entirely of vegetables and who accuse them of causing the "Rain of Stones" which has destroyed and shattered their glass kingdom. The Wizard of Oz also arrives there with his piglets, but the Mangaboos evict them from their country. They then make their way through a series of dangerous lands trying to find their way back to the surface of the earth, and home. They stray through the Valley of Voe, which is colonized by invisible, deadly bears. They soon learn how to walk on water to escape the bears. They make their way through the inside of a mountain and emerge in a dead and soundless world inhabited by wooden, flying gargoyles. Escaping these menacing creatures, they find themselves in a den of young dragons. Finally, just when it seems they are doomed to die imprisoned in yet another underground cave, Princess Ozma sees their difficulty and rescues them; she uses the Magic Belt to bring them to the Land of Oz. Safely back in the Emerald City they renew old friendships, but are interrupted when one of the piglets is missing. Dorothy's ill-mannered kitten is accused in the mystery and a murder trial ensues, with the Wogglebug as the prosecutor and the Scarecrow as the defense attorney. But all ends well and Dorothy, Eureka, Zeb, and Jim return to their homes on the earth's surface after this intriguing adventure. Facts and Trivia1. 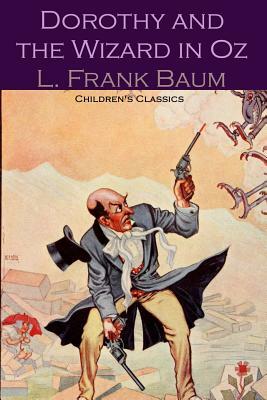 Written shortly after the 1906 San Francisco earthquake and around the time Baum moved to California, the book starts with an earthquake in California. Dorothy and others are swallowed up by cracks in the earth, and fall into an underground cavern, where they begin their adventures.